With the start of the new year I thought a post re-capping some of my tutorials/videos that were posted in 2010 might make it easier for you to find them if you are a new visitor. Now you can see everything in one place! Thanks for visiting and I have lots of ideas for 2011 so I hope you will drop in from time-to-time! ~Krafty Gift Bags - Learn how to create gift bags with brown paper bags. ~Sewing Paper Gift Bags Sampler - Learn how to use sewing paper to create clever gift bags...sampler. 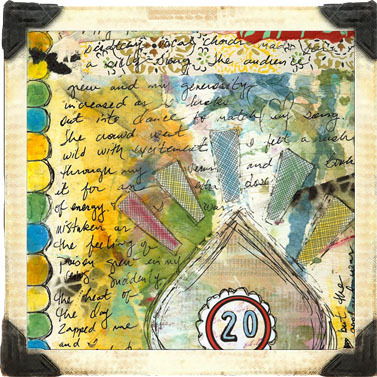 ~Watch the Process - Hidden Places Journal Page - Creating a journal page with a flap for hidden journaling! ~Watch the Process - POT Week 28 Journal Page - Watch as I create a journal page as part of the Points of Two project. ~Altered Tote Bag - Learn how to alter a canvas tote bag with lace, buttons, silk leaves and fibers! ~Shabby Fabric Flowers - Wondering what to do with those scraps of fabric? Create some beautiful shabby flowers! ~Vintage Placemat Journal - Learn how to create a journal using a placemat! ~Ben & Jerry's Upcycled - alter an ice cream pint into a funky catch-all!